After winning the Talento Volkswagen Design contest in 2014, I got a one-year internship at Volkswagen Design Center in Brazil. As part of the internship program - besides our help in everyday tasks and projects of the studio - I had to develop a futuristic-concept car project to be presented at the end of the year for the Volkswagen executives and guests during the Talento Volkswagen 2015 winners announcement event. 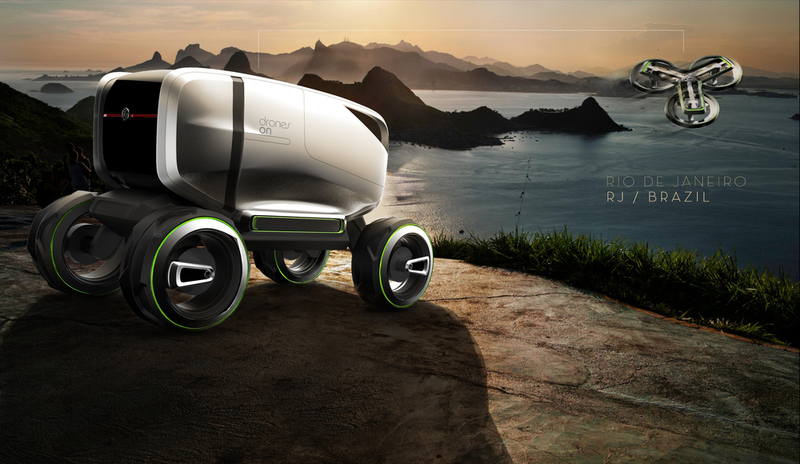 The theme of that year was to develop an off-road futuristic-concept car that would be able to cross all different landscapes in Brazil. A complete set of sketches, renderings and a 1:4 clay model that illustrates the future vision of the concept car in order to push Volkswagen to new future market opportunities and investments. The first task was to identify a new market or trend opportunity that we could push Volkswagen to a forward-looking vision of a business opportunity. After some research, I came up with the idea to work with drones, as it's a new trend mobility market that has the potential to disrupt many different businesses. It was an attempt to push Volkswagen to think beyond cars and come up with this high-level strategy of becoming a more mobility service company, providing for people and businesses a transportation ecosystem of multi-cross-platforms. With a well-defined strategy, I started the most extensive ideation process I have ever taken. I generated hundreds and hundreds of sketches and every day I put them on the wall so the whole team could see and give their inputs. As it was a futuristic-concept project, we didn't have to be close to a specific type of package. So it was a great learning process to detach from this common-ground state of what a car should look like and jump our heads down into a freer creative process. After many explorations, I came up with this idea to design an autonomous off-road vehicle that would be connected to drones, giving it a totally new freedom to access regions that are difficult or impossible on land. This would work for research proposes, monitoring control, data visualization, and many other applications. This modular-detachable vehicle that would be made of three main parts: a cabin station, where people would stay and work; a drone platform, which is responsible to make the cabin move but that is also detachable to go to places by itself; and a flying drone, which could access hard-access regions through the air. After many exploration and design reviews with the design team, I finally came up with the final design. In this stage, I worked on to create a good concept rendering visualization and some in-context images to show the idea. It was the first time I 3D modeled using Autodesk Alias, a great tool that most car designers use to come up with the right sculpture. In this software, you have much more control and at the same time creative freedom to explore forms and come up with a well-crafted surface shape. For rendering, I used Keyshot as it's the easiest and quickest software to come up with a good rendering result. I guess this was the most hard-challenge phase but also the one that I learned the most. After coming up with our final proposal, we were assigned to build a 1:4 clay model of our vehicle. To do that, I had a professional clay modeler assisting me with that task (actually during that period they exchange the modeler three times, so I had the pleasure to work with three different amazing professionals) but also, in the end, the whole modeling team was helping me to finish it (so I have to thank many people for this experience). This is a hard-challenge because it's when you start to visualize live and close your ideas that you sketched on paper, and realize that many parts don't work as expected. Also, both sketching and clay modeling are two really emotional tools, so you have to be really creative to visualize those emotional forms you sketched on a paper on a true well-defined three-dimensional sculpture and still pass the same emotional feeling.